Here's an art journal I've been working on for some time now. It is not finished even though it is brimming at the seams. I have no words in it yet. Maybe I never will. I've been experimenting will modeling paste as well. I love how the paint takes to the paste when dry. I've noticed that a lot of artists are using plaster in their art. I can't wait to try that out. I'm sure the paint will be just as nice on plaster as it is on paste. Maybe it's the same thing. I'm not familiar with either. I'm really in the mood to do a doll. She is pushing at me to get my work done so I can give all my time to her and make her come to life. I just can't wait. Maybe I'll just start her. We'll see. I reopened my Etsy Shop and I've got a couple of pieces on there. If they don't sell reasonably fast I'll just remove them and paint over them. Well, I must go to work on my ebay stuff now. I did post a few items for sale on ebay using the paste. Check it out. See you later. Have a happy day!!! The art journal is just beautiful! You have inspired me to work on a little whimsy. Nothing good yet, but I am trying. I did a painting to take a little break from dolls. 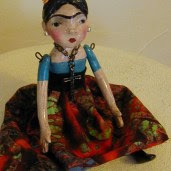 Your going to have to take a break from painting to do a doll. It's good for the soul! Take that break! LOL!